The region of the Caribbean – the islands in the Caribbean Sea, and the coastland of South America, and Mexico – must have seemed like another world to European sailors. Covered in lush, tropical jungle and dotted with volcanic outcroppings and what the Europeans called “smoking mountains” (active volcanoes) the region was also home to many exotic species of animals. In addition, the newcomers brought their own pets and livestock with them. Escaped or released animals quickly became a further fixture of the area. Some, such as pigs and goats, fed the pirates, and their associates, the communities of escaped slaves. Others were amusing or frightening. Early settlers to South America found that an old European monster had taken physical form in the jungle. The legend of blood-sucking vampires long pre-dated the discovery of a certain tiny South American bats. But when the Spanish encountered small flying mammals that landed near sleeping humans, then carefully crawled to the victim’s throat and began to drink blood, it was no stretch of the imagination to call the creature a Vampire Bat. Of course, unlike Dracula, these 3-inch-long animals pose little danger to humans. The local Aztecs called the creatures “butterfly mice” which isn’t scary at all. A far more troublesome rodent (and yes, I know that bats aren’t rodents) was the rat. It was inevitable that the rats that infested European ships came ashore. Once there, the rats made themselves at home. There were no naturalists observing the first introduction of rats to the region, but it’s safe to imagine that they decimated native populations of birds and small reptiles. The European planters didn’t mind this at all. But they did mind when the rats began to eat valuable sugar crops. As far as native animals, North America is the place for Alligators. The Caribbean has crocodiles. Usually calmer than alligators, crocodiles inhabit far southern Florida and the West Indies,, including Jamaica, Cuba, Hispaniola, Puerto Rico and Grand Cayman. Crocodiles are BIG, often 20 feet long, and weighing a ton. They tend to show up wherever there is water and you DON’T want a huge monster that isn’t shy about eating people. Since most pirates wouldn’t have had a chance to visit regions where similar animals lived, these huge creatures, who can lie motionless for hours, strike with the speed of a snake, and run on land faster than a man, must have come a quite a shock. Pirates often carried large caliber hunting rifles when ashore. Modern Floridians must make do by completely surrounding their swimming pools with wire fence. If a pirate stopped by the island of Montserrat he might be offered a plate of Mountain Chicken. And he’d be right to be suspicious of the name. “Mountain Chicken” is a term for the enormous mountain frogs native to the island. At 8 inched long (from nose to tail) and weighing two pounds each, the frogs provide impressive frogleg-drumsticks to those brave enough to eat them. On the friendlier side, the Caribbean is also home to a cute little animal that pre-dates the dinosaurs. 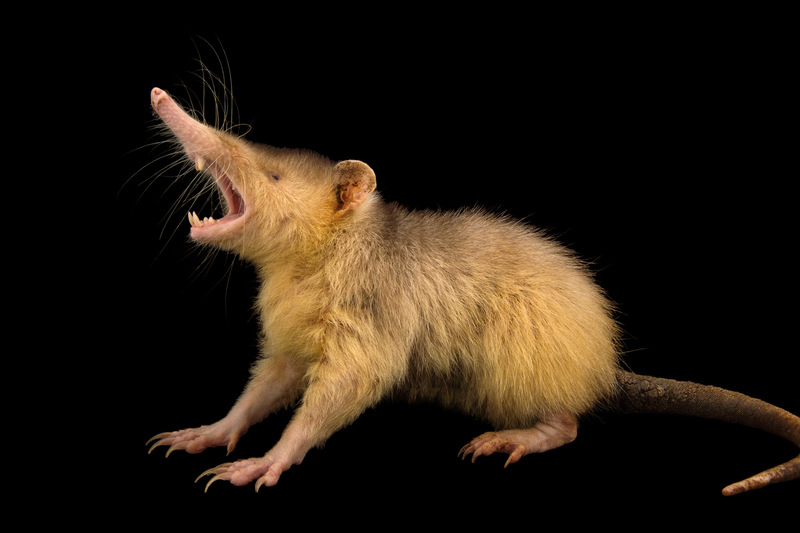 Called a Solenadons, this little beasties have furry bodies, naked feet and tails, and a long flexible snout. They live by sniffing out and eating worms, bugs and other tiny prey, and also eat fruits and vegetables. The animals are noted for having a ball-and-socket joint (similar to a human hip joint) on their snouts, which gives the long nose the appearance of having a life of its own. The tiny creatures are venomous (having poisonous saliva) which may be why they’ve survived the rats. And they’re too small for humans to bother hunting. Solenadons are also defended by the fact that they smell like goats. They live mostly on the islands of Hispaniola and Cuba, and are considered living fossils, which have remained virtually unchanged for 73 million years. The High-Woods Dog of Trinidad is no more a dog than the mountain chicken is a chicken. It may have been given its colorful name by African slaves. The proper word for the animal is tanra, and it’s a tree-climbing relative of the badger. These animals eat almost anything – honey, meat, vegetables and fruit. They have even been observed to steal unripe fruit, then hide it for several days until it ripens. Our last animal is an entertaining creature called the green vervet money. These monkeys probably came to island of St Kitts as the pets of sailors who had been to Africa. Though many New World monkeys exist, the green vervet is definitely an immigrant. And the monkeys came with a problem – a drinking problem. Sailors of the time were notorious for giving alcohol to their pets. And when the monkeys escaped, they sought out free booze anywhere they could find it. In the early days, this meant fermented run-off from the island’s sugar cane industry. But as time passed, St Kitts' sugar production dropped. The monkeys began to come into towns, swiping any alcoholic drink they could. Today the moneys are a nuisance to locals and tourists. They hang around bars, swimming pools and outdoor eateries, and steal any cocktails or cans of beer left unguarded. Then, just like in pirate days, the animals get into drunken fights and generally act like jerks. I guess if you can’t have drunken pirates, drunken monkeys will do.